The revolutionary AGE Reader mu has been presented for the first time at the EASD conference 2012 in Berlin. Over 400 healthcare professionals visited the DiagnOptics booth to have a non-invasive demonstration measurement. Their reactions on the AGE Reader mu are very enthusiastic and confirmed the added value of the device in daily clinical use. The AGE Reader mu helps the doctor in answering the question of whether or not to intensify the therapy. The AGE Reader mu assesses the level of Advanced Glycation Endproducts (AGEs) in tissue. Because of their important role in the development of micro- and macrovasular complications, the measurement of AGEs means a major improvement of diabetes care. 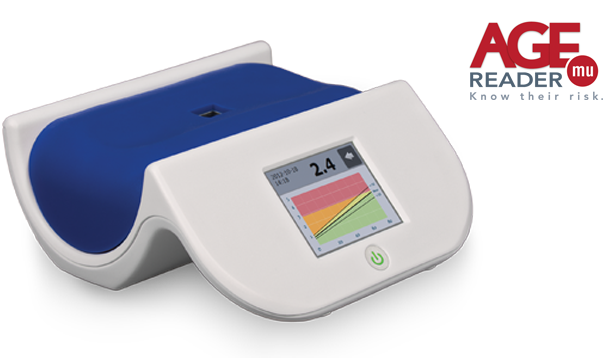 The short measurement time, small size and attractive pricelevel make the AGE Reader mu very suitable for daily clinical use. The AGE Reader mu is a perfect tool for diabetologists and family doctors. Read more about the AGE Reader mu.